From the first moment Vincentio di Vivaldi, a young nobleman, sets eyes on the veiled figure of Ellena, he is captivated by her enigmatic beauty and grace. But his haughty and manipulative mother is against the match and enlists the help of her confessor to come between them. Schedoni, previously a leading figure of the Inquisition, is a demonic, scheming monk with no qualms about the task, whether it entails abduction, torture—or even murder. 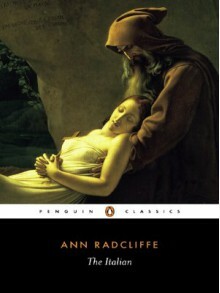 The Italian secured Ann Radcliffe's position as the leading writer of Gothic romance of the age, for its atmosphere of supernatural and nightmarish horrors, combined with her evocation of sublime landscapes and chilling narrative. Read for class. Will post response paper after it's been submitted for class.